Young Living Pure Therapeutic Grade Essential Oils can be used to both aid the relaxation and effectiveness of a massage. Raindrop Technique treatment is an ancient form of massage that was passed down by the Lakota Indians It involves using pure essential oils by Young Living that amplify the benefits of the technique. The technique is performed to detox the body and cleanse the receptors of the cells of the body via the spine redressing disruption of the dna and functions of the body. The oils are used in a specific order so that the vibrational frequency and actions of each oil will open a gateway towards healing in a sequence, so that the damage to dna will be corrected and health restored to the body. It is especially useful for postural and immune improvement as well as helping to prevent disease. It also can release emotional trauma and as the oils are dropped neat (in the French method) from 6 inches above the body it cleanses the aura and energy bodies through to the physical level. Many people who have experienced a Raindrop Technique treatment remark it is the best experience they have ever had! Once tried many will insist on this treatment over and above any other massage or bodywork. (For more information see our dedicated website www.raindroptrainingeurope.com or visit our facebook page by the same name). Holistic massage is a more gentle and soothing massage which allows knots and tensions to be released from the body. It is suitable for people who may be feeling fragile or in need of a soothing treatment at the end of a stressful period. For those who prefer it a firmer touch can be used. A deeper massage for releasing muscle tension and long standing aches and pains is used in remedial massage. 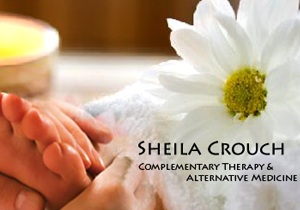 Whether you want to escape and luxuriate in a relaxing massage or wish to relieve tight or aching muscles Sheila Crouch will adjust the session to your needs. Oils or powder can be used to aid a smooth flow of movement over the surface of the body. The treatment can be whole body or concentrated on specific areas of the body. Every care will be taken to make sure you feel relaxed and comfortable during the massage. A massage will generally take 75 minutes so you receive a full hour of treatment. For those suffering from back pain or stiffness in the shoulders and neck; treatment can be enhanced by the inclusion of reflexology and energy techniques which avoid manipulation; so avoiding damage to the site of any injury or pain. For those who need postural realignment spinal touch can be incorporated to relieve joint pain and aid mobility. Whatever your needs, a full discussion and consultation will take place before treatment to ensure that you get the treatment, that will give you the optimum outcome you are looking for. During a treatment you will be able to relax lying flat on a massage table with cushions for extra comfort if you want to have your head or other areas elevated and supported. You will be wrapped in towels and modesty will be maintained at all times. Massage has been practised for thousands of years and has a been praised for its relaxing and calming effects. It also helps the body to rebalance its energies and works at all levels. Individuals differ in their reactions to massage depending on what they wish to achieve. For example, long term tension may require deeper and firmer movements, which may cause some aching as the muscles realign into their natural state. Knots are areas where muscle fibres become bunched and stick together. Sometimes you will hear a pop as air which has become trapped in the fibres is released. Massage is a bit like combing hair, the muscle fibres are separated into their original and natural positions so that the tone and movement and strength is improved. Another treatment may be very gentle as the muscle is coaxed back into its natural state. Muscles tense in response to emotional and physical trauma and stress. To prevent damage they tighten and pull the body into a defensive position. Often the event has passed but the muscles are not aware of this and remain in their protective stance until the body recognises that it is safe to relax. Sometimes a much quicker result can be achieved by activating the muscle memory and resolving the situation both mentally and physically. It is much the same as if no-one bothers to tell you the crisis has passed and you carry on, constantly on red alert,causing further fatigue and weakness. Muscle tension acts like a tournequet on blood vessels and nerves, pulls bones out of alignment and starves organs of nutrients and causes building up of toxins. It is hardly surprising that a massage has such a beneficial effect when a relaxing effect brings relief to all these symptoms. Massage will improve circulation and help to deliver oxygen and nutrients to all the organs as well as improving the removal of waste products from the body. The skeletal system will benefit from both improved circulation to its tissues and the effects of releasing and toning the muscular system which holds the bones and joints in place. Posture will be improved as the joints become more mobile and muscle tone is improved. The nervous system is both soothed and stimulated so it can feel balanced and the body can function more comfortably. The skin is improved by both the improved circulation which helps to both improve its appearance by encouraging healthy cell replacement and the removal of dead skin cells from its surface. Hormones released during a massage help to induce a feel good factor and aid in the state of relaxation which is experienced during a treatment. The psychological sense of relaxation and wellbeing from a treatment can help to lift your spirits and reduce anxiety and stress from the mind. Young Living Pure Therapeutic Grade Essential Oils can be used to both aid the relaxation and effectiveness of the treatment. Many people who have experienced a Raindrop Technique treatment remark it is the best experience they have ever had! Also the act of allowing yourself to be given time and care can induce a sense of both well being and self-worth in a modern lifestyle which rarely allows for time to respect your own needs. Whether you are having Indian Head Massage, Reflexology or another touch therapy included in the treatment to suit your individual needs and wellbeing you will emerge feeling relaxed. Many clients describe the effects as "wonderful", "I feel like a new person".